We first met Bubba in the summer of 2012. A truck hauling a horse trailer pulled into the driveway of Phoenix Rising Equine Rescue and Sanctuary. Inside the horse trailer were two bonded draft horses, Bubba and Bart. The boys were being relinquished by their owner. In a matter of 20 minutes, they were unloaded and led to a paddock from where they watched their owner drive away. From that paddock, they saw their human for the last time. In a matter of 20 minutes, the world that Bubba once knew, changed forever. In a matter of 20 minutes, one chapter ended … and another began. As we got to know Bubba [and as he got to know us] it became clear that his life had been difficult in the past. He was very lame and in a good deal of pain; he was [and still is] plagued with hoof issues. He was nervous, uncertain of what may or may not happen next. He was suspicious and wary. It seemed as if it had been a long time since he was able to trust anything or anyone. His buddy Bart was the only thing that brought him any comfort. It is unclear how long Bubba and Bart knew each other before arriving at our sanctuary. Reports are that they had lived together for a significant number of years. Regardless of how long they had known one another, they needed each other, now; they were [and still are] bonded to one another. Days and weeks went by. Bubba began to adjust to his new surroundings. He began to open up. He began to trust, slowly. When he opened up, he showed that along with his big boy body, he had a big boy personality and big heart! Now, in his early twenties, what Bubba wants, Bubba gets…most of the time. Let’s face it, at 1700 pounds and standing 17 hands high, he is a force. If he is in his stall and would like something from you, he will let you know. With a nod, a nudge or by grabbing and throwing his halter at you [smile] – he will let you know. If he is in his paddock and would like something from you, he will let you know. By thundering over to the fence or staring down at you, he will let you know. And when he does let you know, it is hard to resist him. It is just plain hard to be in Bubba’s presence and not be impressed. He has a strong neck and chest that show he is no push over. His legs are like small tree trunks. One of his hooves is larger than four of my feet put together [I wear a size 7 shoe]. When he moves, so does everything around him. The air and dirt in Bubba’s immediate space mix together and waft upwards to create the ‘Bubba Cloud’. He is larger than life – literally. Since his arrival at Phoenix Rising four years ago, Bubba has transformed the sanctuary – literally. We have had to transform in order to keep his strength from getting him into trouble. Fences are now electrified. Stall doors are now reinforced. Stall walls have been strengthened. Bigger and better equipment has been purchased in order to keep the big boy from breaking out, breaking down or breaking things. When Bubba is bored and needs a toy or when he needs something upon which to scratch his leg, he will toss his hay trough around like it is a tiny, light weight piece of paper. Bubba is protective over those with whom he bonds, those he believes to be in his herd. At the moment, he is in a love/hate/love relationship with another mare at the sanctuary, Sierra. Bubba panics when his buddy Bart is out of his sight because he still loves him so deeply. Bubba’s feelings get hurt – when he is not included in an activity. When Bubba sees an opportunity, he will go for it – like an opportunity to push through the fence to get the grass on the other side or the opportunity to snag a treat out of your pocket. We rejoice in Bubba’s personality and antics – for you see, there was a day when he did not feel comfortable enough to show us who he is. We celebrate Bubba. We are so happy to be in his presence. We are so pleased to have him as such a large part of our lives. We are so thankful he chose to trust, again. 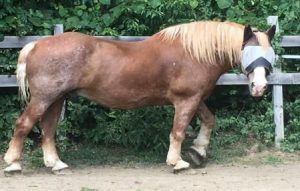 We are also thankful to all of the supporters of Phoenix Rising Equine Rescue and Sanctuary who allow us to offer a Safe Haven of Hope to Bubba and other horses in need.